The Houston Cougars continued their resurgence last season, winning the CUSA West division title and then defeating the flagship program of Conference USA, Southern Miss, in the league championship game. There have been two constants in this league since its inception: Southern Miss winning, and significant ups and downs with the remaining league programs. USM has recorded 13 consecutive winning seasons, reaching the postseason in 9 of the past 10 years, while the rest of the league has taken turns challenging for division titles and then going into an immediate downturn. Last season Rice and Houston made huge turnarounds, going from 5 combined conference wins to 13, while Central Florida and Memphis went from 12 combined wins down to 4. 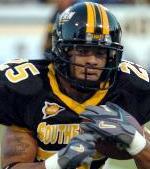 Overall, the conference is focused on improving its bowl record in 2007 after a 1-4 tally last season, as Southern Miss was the only program able to secure a bowl victory. The 2007 season is shaping up to be an interesting race with last year's championship game teams Houston and USM both appearing more than ready to defend their division titles. Challenging the Cougars in the West projects to be the group of Southern Methodist, Tulsa, and UTEP, while looking to overcome USM in the East are rebounding programs in Memphis and Central Florida. The race for bowl berths looks to be a wide open field with only UAB, Rice, and Tulane looking like programs that are still in the midst of major rebuilding projects. It's time to breakdown what CUSA has to offer the college football landscape in 2007. 1. Key #1 is just how much will the graduation of QB Kevin Kolb slow down the Houston offense. Kolb left the Cougars as the school's all-time leading passer with 12,964 yards and had started for the past 4 seasons, leading the school to 3 bowl games during that time. Blake Joseph steps into the large shoes of Kolb after attempting only 8 passes last year, and he will be counted on to keep the offense humming. 2. Key #2 is to find the right team that is going to rise from the depths of Conference USA to challenge for the league title in 2007, as it seems to occur every year. One top candidate appears to be a Memphis team that had everything go wrong last season on its way to a 2-10 record, but they now return 16 starters ready to make amends. Another noteworthy challenger is Central Florida, who returns 17 starters from their 4-8 team, and the Knights want to showcase their brand new on-campus stadium with a conference trophy. 3. Key #3 is which team will adapt best to the implementation of new offenses, as numerous CUSA programs are installing new attacks in 2007. Tulane, Tulsa, and UAB are implementing totally new offenses, while East Carolina, Memphis, and UTEP will undergo a change in focus in their game plan. The trend in the conference is more spread offenses designed around quick hitting plays, an offense that was worked to perfection last season by Houston.